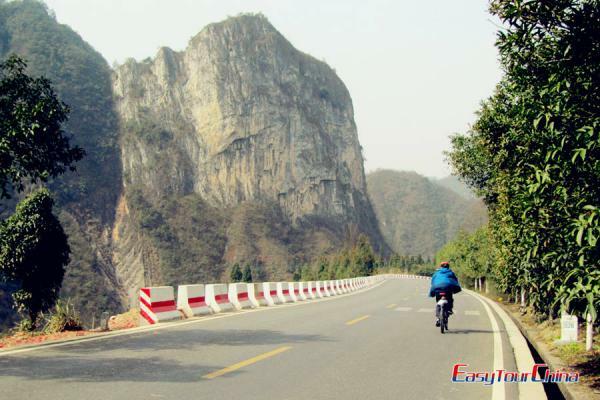 The Piled Silk Hill lies to the north of Guilin city. The tourist will find the hill broken here and there with the strata exposed on the sides like piled-up silk, hence the name. The top of the Piled Silk Hill provides a panoramic view of the beautiful Guilin. Legend has it that there used to be many osmanthus trees on the hill, so it is sometimes called Osmanthus Hill. As there is a particular strange wind cave in the hill, it is also named the Wind Cave Hill. Actually this point of interest consists of two hills named Siwang and Yuyue and two peaks called Xianhe (Crane) and Mingyue (Bright moon). Climbing several flights of stone steps, the tourist will first reach the Piled Silk Pavilion. To the west of the pavilion is the Siwang Hill standing opposite the Yuyue Hill. Inscribed on the pavilion is a "Note to the Siwang Hill" written by a Tang Poet Yuan Hui. The three big characters meaning the "Piled Silk Hill" were written in 1964 by Shen Yinmo, a contemporary calligrapher. Turning back from the Xianhe Peak, the tourist will have access to the Wind Cave by entering the Piled Silk Gate and Passing through the Yangzhi hall. The marvel of the Wind Gate, a most extraordinary sight on the Piled Silk Hill, is characterized by its gentle breeze. The cave runs from south to north and is breezy all the year round. In the cave entrance of the cave there is a Breeze-Inviting Pavilion, which was first built in the Ming Dynasty and rebuilt in 1972. Two-storey and open on all sides, it is an ideal place for enjoying beautiful views. Coming out of the pavilion and walking along the right side of the hill, the tourist will find the River-Watching Pavilion, which was first built in the Ming Dynasty and rebuilt in 1954. Climbing more than 200 steps farther from the River-Watching Pavilion, the tourist will reach the Mingyue Peak, where stands the Cloud-Catching Pavilion built after 1949. The scenery is rewarding and looks like a huge picture of embroidery. It is really a tourist attraction. Everyday it draws many thousands of visitors.